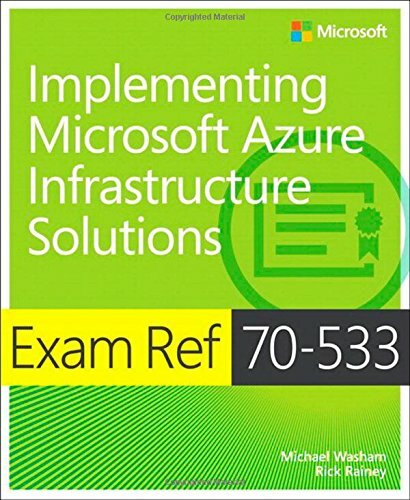 Prepare for Microsoft Exam 70-533–and help demonstrate your real-world mastery of Microsoft Azure infrastructure solution implementation. Designed for experienced IT pros ready to advance their status, Exam Ref focuses on the critical-thinking and decision-making acumen needed for success at the Microsoft Specialist level. Exam 70-533 focuses on the skills and knowledge needed to implement web- sites, virtual machines, cloud services, storage, Azure Active Directory, and virtual networks with Microsoft Azure. Passing this exam earns you a Microsoft Specialist certification in Microsoft Azure, demonstrating your expertise with the Microsoft Azure enterprise-grade cloud platform. You can earn this certification by passing Exam 70-532, Developing Microsoft Azure Solutions; or Exam 70-533, Imple- menting Microsoft Azure Infrastructure Solutions; or Exam 70-534, Architecting Microsoft Azure Solutions.